he year 1896 was eventful for the Wright brothers. It was the centennial anniversary of the founding of Dayton, Ohio. As descendents of the first pioneers who settled the town, the Wrights were involved with the festivities. Orville worked with the Dayton Bicycle Club to build one of the floats in the centennial parade. It was also the year the Wrights began to manufacture their own bicycles. They introduced two models, the economically-priced St. Clair and the top-of-the-line Van Cleve. Both were named for people who had figured large in Dayton's early history. Elsewhere in the world, there was a flurry of aeronautical activity that Wilbur and Orville could not help but notice. The newspapers were filled with accounts of experiments with balloons, dirigibles, gliders, ornithopters (machines with flapping wings), and airplanes. Most were derisive stories about laughable failures, but in their midst were three remarkable successes. The first party of pioneers to reach Dayton in 1796 included Catherine B. Van Cleve, the great-great-grandmother of the Wright brothers. 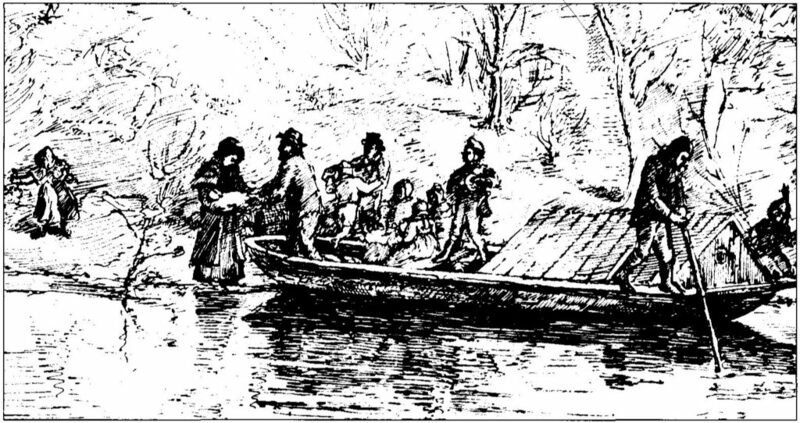 Catherine was the first person to step off the pirogue onto Dayton's soil, followed by her daughter, Mary Van Cleve, Wilbur and Orville's great-aunt. No one was laughing on 6 May 1896 when Dr. Samuel Pierpont Langley, Secretary of the Smithsonian Institution, flew his steam-powered Aerodrome No. 5 half a mile over the waters of the Potomac River. Langley was an accomplished astronomer who made the first detailed observations of sun spots, invented the bolometer to measure electromagnetic radiation, and vastly simplified the running of the world's railroads by creating "Standard Time" and time zones. He was also the most well-known scientist in America due to his campaign of lectures, newspaper stories, and magazine articles to popularize general science. In 1886, while he was the director of the Alleghany Observatory, he became interested in aeronautics after listening to a presentation on bird flight at a meeting of the American Association for the Advancement of Science. 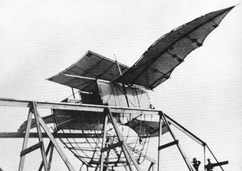 He built a large "whirling table" to test wing shapes and began a study of aerodynamics. Before his experiments could bear much fruit, he was appointed Assistant Secretary of the Smithsonian Institution in January 1887 and then Secretary nine months later when his boss died. Langley continued his aerodynamic experiments at the Smithsonian and built an even larger whirling table. Since 1881, when Louis Mouillard published Empire of the Air, aeronautical scientists had been divided into two camps -- chauffeurs whose goal was to create a stable aircraft that could be easily steered around the sky and pilots who believed that the equilibrium of the aircraft must be maintained by a skilled operator. Langley was squarely in the chauffeur camp. He built rubber band-powered airplane models in hopes of finding a stable configuration. He had no great success at first, but by 1891 he had developed a model that made stable flights. That same year he began building a series of larger flying models that he called "aerodromes" from the ancient greek aerodromoi which he translated to mean "air-runner." The first, Aerodrome No. 0, was never completed. Numbers 1, 2, and 3 were completed but never test-flown. Apparently, they did not pass the aerodynamic tests Langely had devised. In 1893, Langley twice attempted to launch Aerodrome No. 4 from a 38-foot (12-meter) scow on top of which he had built a workshop and a catapult. Both attempts failed. By 1896, he had competed two more aerodromes, numbers 5 and 6, with wingspans of about 14 feet (4 meters) and powered by small steam engines. On May 6, Langley had his launching platform towed out into the Potomac River a few miles south of Washington DC. The first launch did not go well; the left wing of Aerodrome No. 6 collapsed and it fell into the river. But on the second launch, Aerodrome No. 5 left the catapult, dipped toward the water, then began to gain speed and altitude while remaining perfectly stable in the air. It eventually climbed to 100 feet (30 meters) above the water and remained aloft a minute and a half. Later the same day, it made a second flight tracing three lazy circles in the sky at altitudes up to 60 feet (18 meters) in one minute and thirty-one seconds. Although it carried no pilot, it was the largest powered aircraft ever to make a sustained flight up to that time. Its success gave critics pause and captured the imagination of the American public. The plan for Langley's whirling table at the Allegheny Observatory in Pittsburgh, Pennsylvania. One of Langley's successful rubber band-powered "aerodromes." Note that the rubber motor is intended to be stretched, not twisted. Langley's Aerodrome No. 5 in the Smithsonian's aeronautics laboratory. This same laboratory eventually grew to become the National Air and Space Administration (NASA). A successful catapult launch of Aerodrome No. 5. 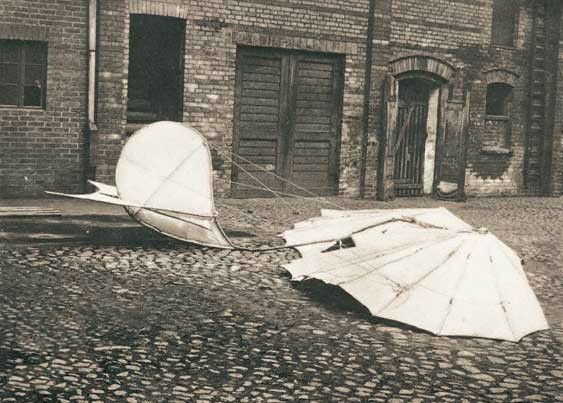 The public's attention was focused on Germany on 9 August 1896 when Otto Lilienthal, by far the most accomplished pilot to date, was caught by a gust of wind that dashed the pilot to his death. Lilienthal was an inventor, engineer, and manufacturer who was fascinated with the possibility of manned flight. He and his younger brother Gustav spent the decades of the 1870s and 1880s collecting information on aeronautics and performing experiments in aerodynamics. In 1889, Lilienthal published a book, Der Vogelflug als Grundlage der Fliegekunst (Birdflight as the Basis of Aviation), that summed up his and his brother's work. It quickly became a milestone in aeronautics. 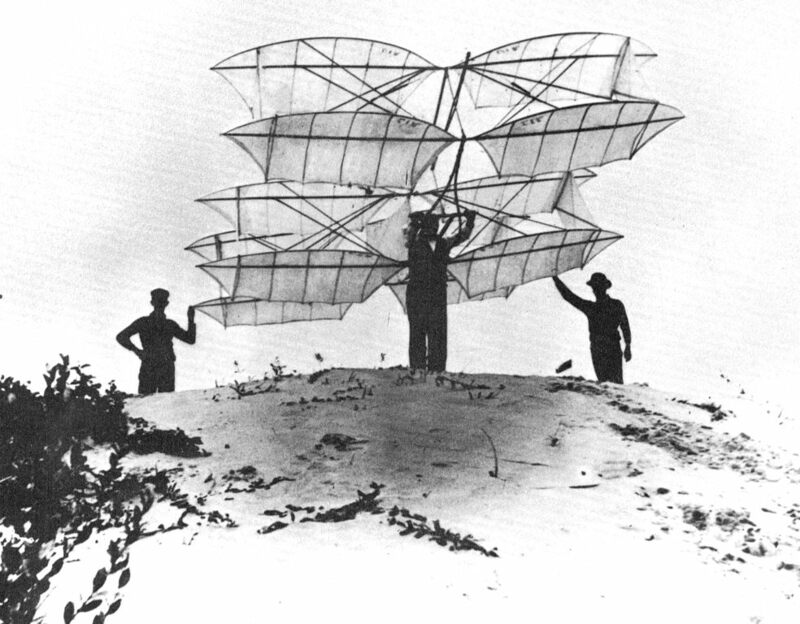 In 1890, Lilienthal began to experiment with manned gliders. His craft had no aerodynamic controls; he navigated his gliders and maintained equilibrium by shifting his body weight to alter the balance of the glider in the air. His first attempts were just barely successful – he achieved glides of no more than 80 feet (24 meters). But he kept at it, eventually building and testing 16 gliders, including biplane glider and a glider that he intended to fly as a powered machine but never did. With each new aircraft, he improved the performance of his machines and refined his piloting skills. Before his death, he had made over 2000 glides, some as long as 800 feet (244 meters). He also built two facilities for launching his gliders, a "flight station" at Rhinow Hills and an artificial hill called Fliegeberg (Flight Hill) near Lichterfelde, a suburb of Berlin. These were the world's first airfields. With all this flying going on, Lilienthal's reputation grew. "The Flying Man" was a common subject for newspaper and magazine articles all over the world. Great scientists came to visit him, including Samuel Langley and Octave Chanute. In 1894, he began to manufacture what he called his "Standard Glider" and sold them to aspiring pilots in Europe and North America. He was flying this glider on 9 August 1896 when he flew into a thermal, a burst of hot air rising from the land beneath him. The gust turned up the nose of his aircraft sharply and Lilienthal kicked forward to bring it down again. But the glider did not react quickly enough. Lilienthal ran out of flying speed, the glider stalled, and Lilienthal plunged to his death from an altitude of 50 feet (15 meters). His dying words were reported as "Sacrifices must be made." The fatal accident was news worldwide and many who believed in the possibility of manned flight were momentarily discouraged. 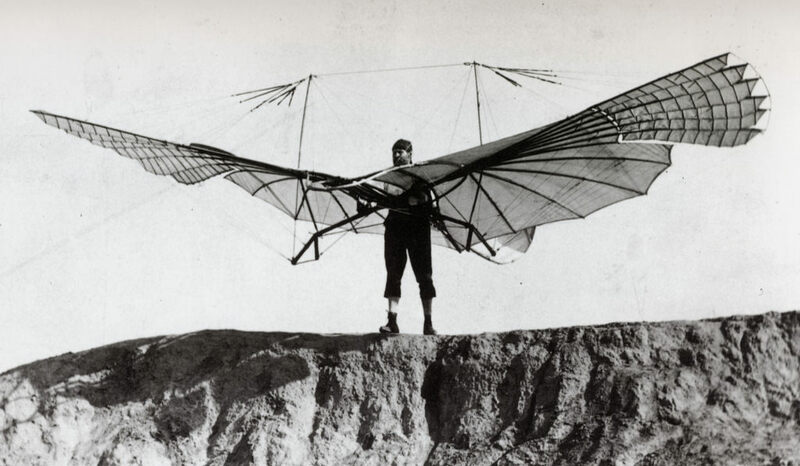 Otto Lilienthal with one of his early gliders. The flappers at the ends of the wings were intended to propel the aircraft, but Lilienthal never tested a powered version. 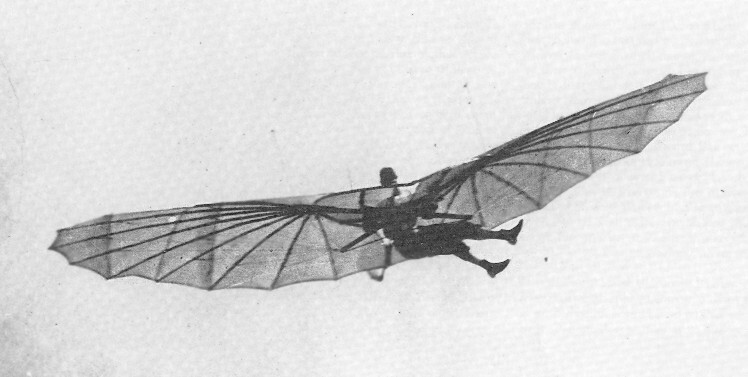 Lilienthal balanced his gliders in the air by kicking his legs. This shifted his weight and altered the glider's center of gravity. "Fliegeberg," also called "Flugmonten" (Flight Mountain), was an artificial hill with a conical hangar on top. Lilienthal's glider after his fatal crash. 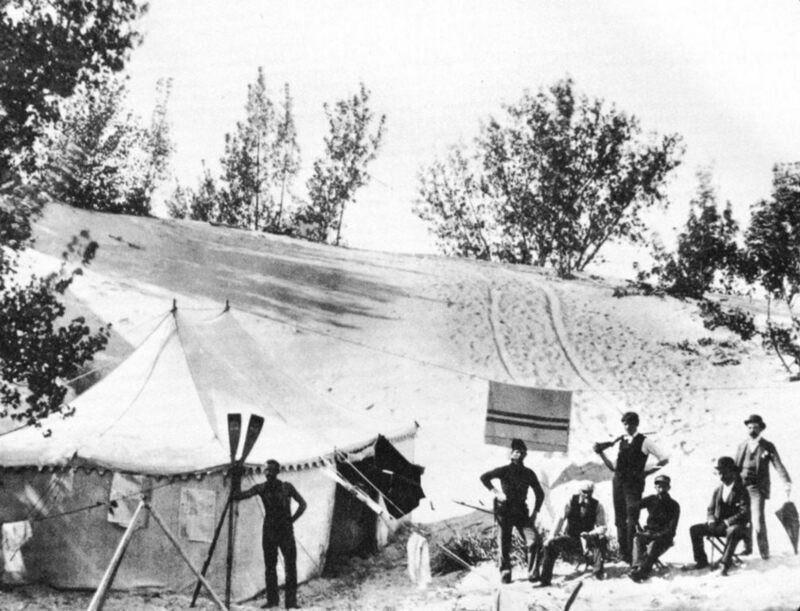 But their hopes were revived again on August 29 when Octave Chanute gathered a band of aeronautical enthusiasts and began testing glider designs at the Indiana Dunes near Miller, Indiana. Chanute was an accomplished engineer with an international reputation for building bridges and railroad terminals. Among his many accomplishments, he had designed the "Hannibal Bridge," the first bridge across the Missouri River. He also invented a method of preserving wooden railroad ties and utility poles with creosote (still in use today) which allowed him to retire early and pursue his interest in aviation. He began by collecting everything known about the subject, then published a series of articles on the prospect of manned flight. 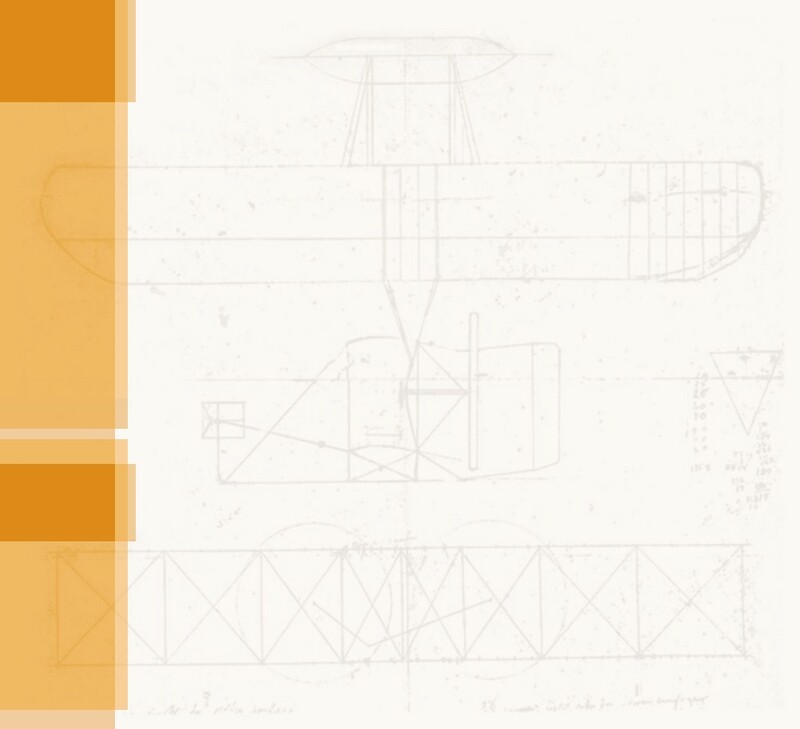 In 1894, he compiled these articles into a book, Progress in Flying Machines, a summary of the science and engineering of aeronautics up to that time. It became an instant "must-read" for those interested in manned flight. That same year he started experimenting with Lilienthal-type gliding machines. 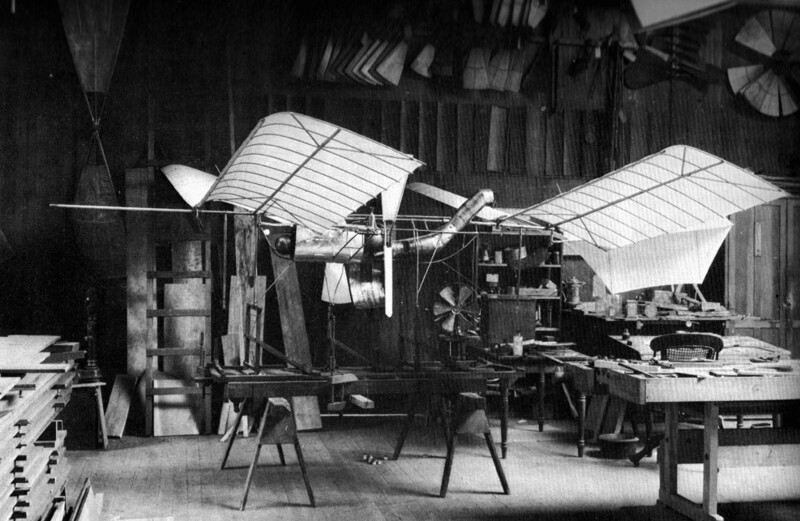 A year later, in 1895, he was designing his own gliders. Chanute walked the line between chauffeurs and pilots. He worked to find a wing configuration that would give his aircraft automatic stability, but he retained Lilienthal's system of weight-shifting for navigation. Augustus Herring and William Avery helped Chanute to build and test-fly these gliders. Chanute also financed William Paul Butusov, a Russian immigrant, to build a glider of Butusov's own design. 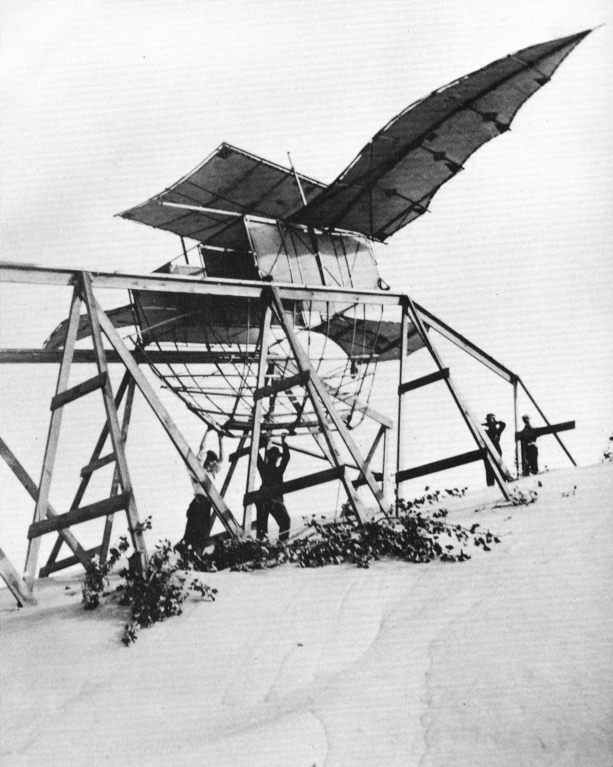 On 22 June 1896, Chanute, his son Charles, Herring, Avery, Butusov, two dogs, and several reporters took two gliders – an "improved Lilienthal" and a multiwing machine dubbed the Katydid – to the sand dunes around Miller. They tested the Lilienthal first, found it "cranky," and discarded it. The Katydid was much more docile in the air, but was difficult to navigate. Nonetheless, after two weeks in the dunes, Chanute felt he had learned more about aeronautics than he had in the previous ten years. They were back again on August 29 with two new gliders. Butusov had completed a large bird-like glider he dubbed the Albatross. 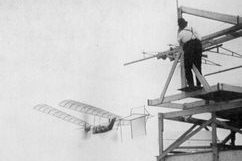 Chanute and Herring had hastily thrown together a triplane whose superposed wings were trussed in much the same way Chanute had once trussed bridges. The Albatross did not fare well; it was wrecked on its first glide. The Chanute-Herring triplane got off to an auspicious start; it was difficult to control. Chanute deduced that the problem was the machine had too much wing and his pilots didn't have enough weight to throw around. He had the lower wing removed and suddenly everything changed. Herring and Avery began making stable, controlled flights, staying aloft for up to ten seconds and covering over 250 feet (76 meters). For the moment, the Chanute-Herring biplane glider was the most advanced flying machine in the world. Chanute's camp in the Indiana Dunes..
Chanute's Katydid had multiple wings that could be added, subtracted, or moved to reconfigure the glider. Butusov's Albatross was too large to be hand-launched. It rolled down a ramp. 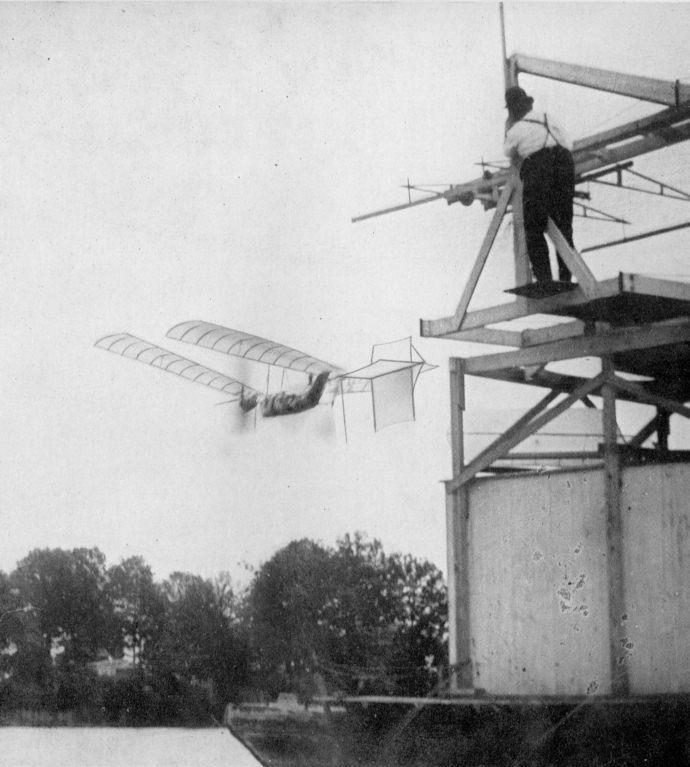 Augustus Herring flying the Chanute-Herring glider as a biplane.